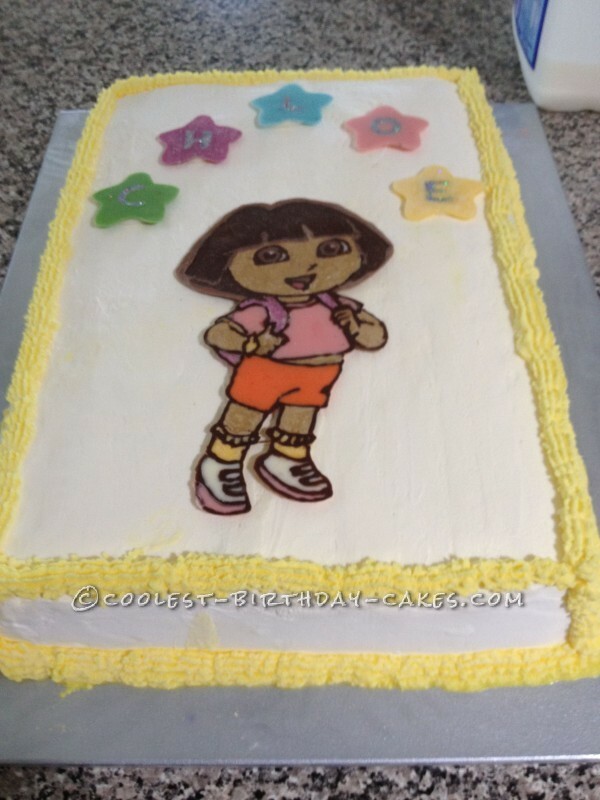 My 3 year old absolutely loved this Dora cake. The only thing was making an ice cream cake in the middle of summer in the Tropics, was not the easiest thing. I spent most of my time icing the cake head first in the freezer. The good thing was due to the heat it melted quick on the day making it easy to cut, easy for the kids to eat and cooled every one down. To make this cake you firstly just need to make a large rectangular ice cream cake. You could make ice cream from scratch or cheat like I did. I simply melted 8 litres of vanilla ice cream stirred in my treat of choice in this case M & M’s and then poured it in the tray and re froze it. Once this had reset I tipped the rectangle cake out on to the icing board and covered the entire cake with whipped cream and piped yellow whipped cream using an open star nozzle around the edges. You either have to be very quick at this step or do it in the freezer. Once this was done, I again refroze the cake. 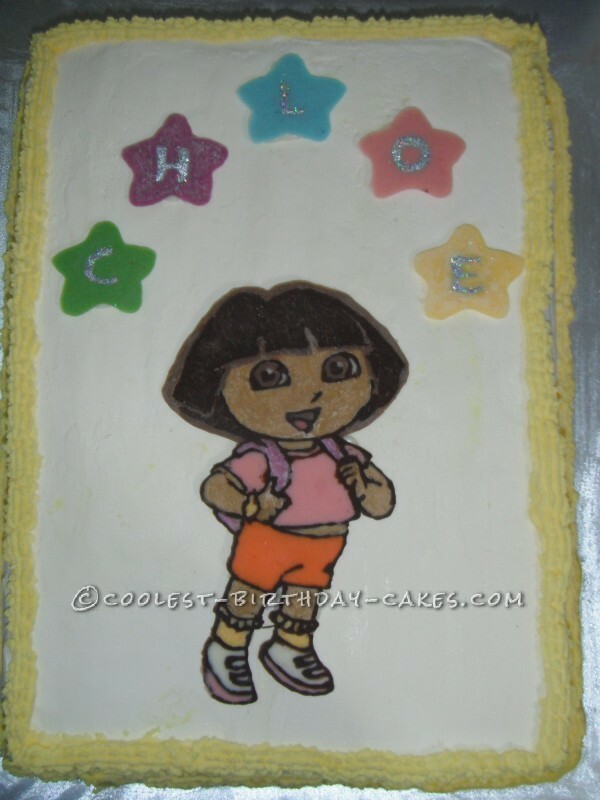 To make the Dora image and stars I used copies of images I found in the kids coloring books. Firstly I traced the desired images on to baking paper and then turned it upside down so everything was a mirror image. I then taped the baking paper to cutting boards. The images themselves were made out of melted chocolate, very fiddly, time consuming and messy but I loved the end result. To make the stars I piped the main color chocolate of the star first leaving the letter exposed. Once this chocolate was set I filled the letter in with edible glitter and then filled over the top of it with white chocolate. 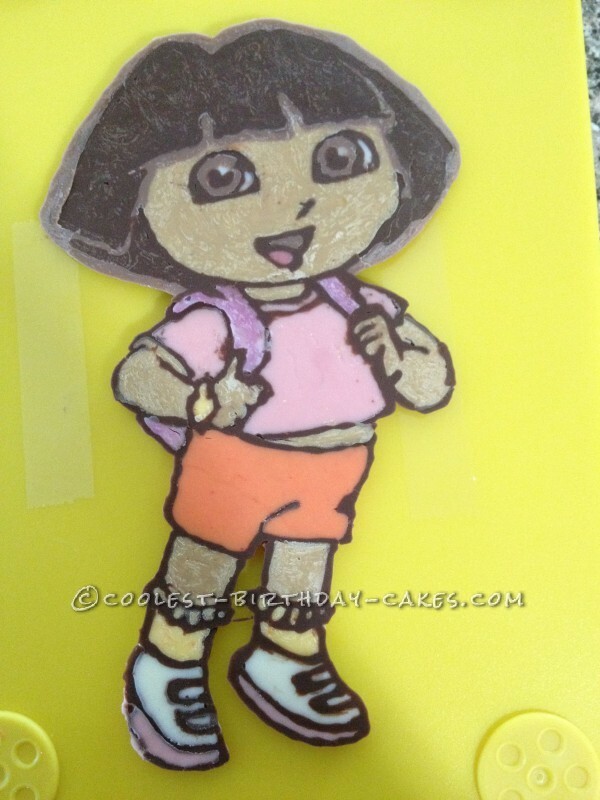 To make Dora I piped the outline out of a dark chocolate and let it set. I then filled in all the individual sections with the appropriate color until it was complete. The final step was to use a dollop of melted white chocolate to attach all the individual shapes on the top of the cake. Job done!